Subsurface drip irrigation (SDI) drip tubing microirrigation systems are most commonly used for tree and vine (permanent) crops. These systems come in a variety of designs so it is difficult to provide evaluation guidance that applies to all installations. One characteristic that is common to most drip tubing SDI systems is that the lateral line ends are exposed for ease of flushing, making it easy to take pressure measurements there using a pressure gauge equipped with the appropriate drip fitting. Sometimes the heads of the laterals are exposed as well and pressure measurements and flow rate measurements can be taken there. 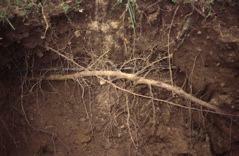 Subsurface drip tubing excavated in a walnut orchard. Notice the root growth around the drip tubing. Photo: L. Schwankl. In general it is not practical to measure the emitter discharge rates in an SDI systems. It is just too difficult and time consuming to excavate and expose the tubing, which would be necessary in order to measure emitter discharge rates. Drip tubing SDI systems frequently operate at higher pressures than do drip tape systems. Usually the pressure is below 30 psi, but not always, so a 0 to 60 psi pressure gauge is appropriate. As mentioned previously, the lateral line end is often exposed to permit flushing, allowing pressure measurements to be taken at the lateral ends. If the head of the lateral is exposed, pressure measurements can also be taken there. A non-pressure-compensating (NPC) drip tubing system that has limited pressure variability (less than 10 to 20%) should apply water uniformly unless it is affected by emitter clogging. Pressure compensating (PC) drip tubing systems, in the absence of clogging, should be applying water uniformly so long as the operating pressure remains above a minimal threshold (see the manufacture's technical information for this threshold), even if there are significant variations in pressure. Two flow meter options are available for measuring discharge rates in the drip tape laterals. First, a single flow meter installed at the head of the system can measure the total flow. If pressure is held constant, an increase in flow rate may indicate leaks in the system. Similarly, a decrease in flow rate over time may be indicative of clogging. One disadvantage of using a single flow meter is that if pressure readings indicate a problem, the single meter does not indicate where in the system the problem is occurring. 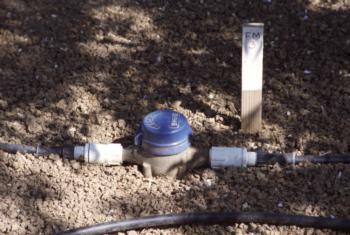 Small flow meter installed in a drip irrigation lateral line. Photo: L. Schwankl. A second option is to use either temporarily- or permanently-installed small flow meters on selected lateral lines. These will work so long as there is an exposed section at the head of the lateral lines where they can be installed. The lateral line flow meters, often ¾" throat diameter meters, are readily available and cost approximately $75 each. Installing one of the smaller flow meters for every 2 or 3 acres is a practical plan, balancing cost and utility. Lateral line flow meters are more sensitive to flow rate changes than the single meter at the head of the system, so they can detect clogging more readily. Since these flow meters record a totalized flow, you must keep track of the operating time in order to determine the actual flow rate to the lateral line. Since the hard tubing SDI systems are buried, often 12 inches or more deep, direct measurement of emitter discharges is not practical.